On April 15, 2017 my good friend John Arbuckle passed away at the much too young age of 63 of issues arising from a lung infection. He had been having breathing problems for much of the 30 years I knew him and had been carrying an oxygen concentrator wherever he went for several years, so this was not totally unexpected, but it still hit me very hard. I've been spending much of the last week thinking of John and the good times we had together. 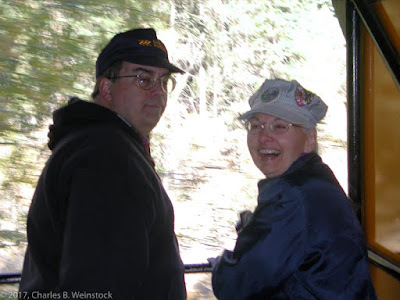 One such time was the Colorado Narrow Gauge Tour that John led three of us on in 2001. This is the story of that tour. Although John did not participate in the beginning and end of the account below, I always think of him when I recall this trip. Think of this article as therapy for me after his loss. I am a member of AAPRCO, the American Association of Private Railroad Car Owners. Understand that I am not a car owner, but just a hanger-on. One of the reasons to be a member is to be allowed to participate in AAPRCO's annual convention. The big deal about these conventions (for me) is that they are preceded and followed by a special train from some distant city to the convention city. AAPRCO members are allowed to ride the train if they can find a car owner who is willing to take them. This is usually easily doable if one is willing to part with a sufficient number of dollars. The 2001 convention was to be held in Denver beginning on Wednesday, October 3 and ending on Saturday, October 6. There would be two special trains to the convention. 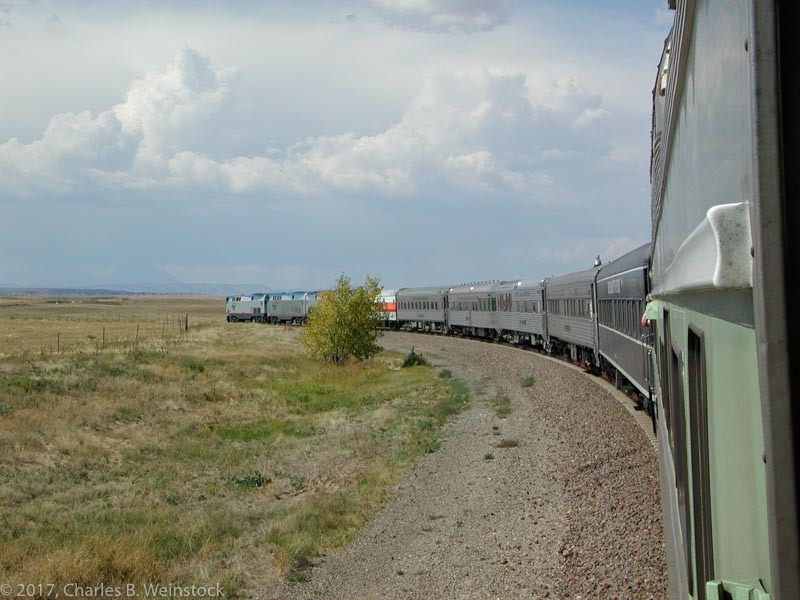 The one I rode left Chicago on Saturday morning, September 29 and reached Denver on October 2, with overnight stops in Kansas City, Amarillo, TX (where it combined with the train from the west coast), and Pueblo, CO. The return trip left Denver on Sunday, October 7 and reached Chicago on Monday, October 8 via a circuitous routing, but with no overnight stop. While I was committed to riding the trains to and from Denver, I had no particular interest in attending the actual convention. It made no sense to fly home from Denver on October 3 and back on October 6, so the question became how to fill the time productively. After thinking about it a while it occurred to me that I had ridden neither the Durango & Silverton nor the Cumbres & Toltec narrow gauge railroads. After scoping out the distances it appeared that it would be possible to do both during the four days. But I didn't want to do this trip alone and most of my regular traveling companions had ridden both railroads--some multiple times. It turned out that earlier in the year I had planned a visit to Canada with Reg Mitchell (then a NASA engineer) and another friend that had fallen through. I mentioned the idea of visiting the narrow gauge railroads to Reg, mainly for ideas, and discovered that he was in the same boat that I was. 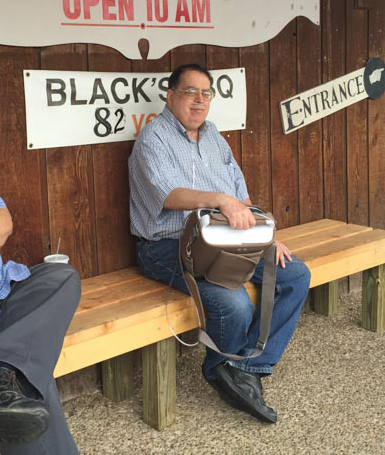 He quickly agreed to the trip and shortly thereafter told me that mutual friend, Carol Sulanke (a librarian at Indiana University) wanted to join us. We had in mind getting a fourth to fill the car, but began planning at this point. Our initial plan had us driving to Durango on Wednesday (about 350 miles), riding the Durango & Silverton roundtrip to Silverton and then driving to Alamosa (about 150 miles) on Thursday, riding the Cumbres & Toltec from Antonito to Cumbres (with bus return) on Friday, and driving back to Denver on Saturday (about 230 miles). This would mean a night in Durango, and two nights in Alamosa. On September 6, John called and said that he was interested in joining us--even though he'd ridden both trains multiple times. As a courtesy I asked the others (knowing the answer before I asked) and he was unanimously accepted as the fourth member of our group. Since John had done these trips many times in the past, he had some suggestions to modify our itinerary. 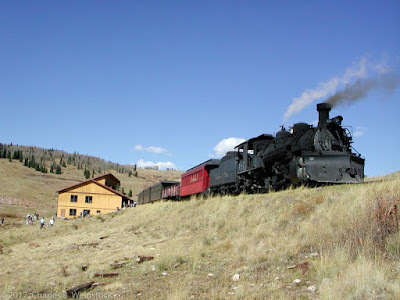 The significant change that he suggested was that we ride the Cumbres & Toltec eastbound (Chama to Antonito) because the climb out of Chama to Cumbres Pass behind a steam engine was impressive. John also suggested that we spend the second night in Pagosa Springs rather than in Alamosa. We had some discussion about that with Carol preferring to stay in Alamosa, but then Reg discovered that the highway through Wolf Pass in Colorado would be closed at night due to construction. That pretty much eliminated the idea of going to Alamosa directly from Durango. So our overnights were pretty well set, as was much of our routing. When the dust settled (literally) it turned out that the convention was still happening as were the special trains. The narrow gauge trains would also be operating. The main difference, from our point of view, was that almost nobody was traveling in the months after 9/11, so hotel reservations, while never difficult, were exceedingly easy to come by. We ended up staying at the Best Western Rio Grande in Durango, the First Inn of Pagosa, and the Comfort Inn in Alamosa. At the last minute I also decided to share a room with John at a La Quinta in Denver the night before the tour left. I caught a USAirways flight from Pittsburgh to Chicago, which arrived mid-afternoon. I took a subway from O'Hare to Logan Square and a bus to within walking distance of my hotel in Chicago, the Quality Inn near Madison and Halstead. We could have stayed on the train that night, but we knew (from past experience) that Amtrak would be switching the train in the middle of the night which would make sleep fitful. I taxied to Union Station where I boarded the Silver Solarium, the car I rode to and from Denver. The Silver Solarium is a round-ended dome observation car that originally ran on the California Zephyr. At the time it was owned by the late Nav Fosse, who owned a concrete pipe/culvert manufacturing business in Iowa. I had ridden the Silver Solarium several times before and it had become a second home to me. I was sharing bedroom "B" with Dave Ingles for this trip and we had flipped a two-headed coin and I chose tails so I got the upper berth. I don't mind the upper berth (a very comfortable bed) but it is awkward when having to go to the bathroom in the middle of the night. I don't have detailed notes about this trip, but it was scheduled to leave Chicago at 7am and actually left at 7:05am. The routing to Kansas City was on the CB&Q via Galesburg, IL, Quincy, IL, and Brookfield, MO. Much of Quincy to Kansas City (all?) was new mileage for most people on the train. Arrival was scheduled for 6pm but we only cared because we wanted to see the line in daylight since dinner was served on the train...and our beds were ready anytime we felt like retiring for the evening. 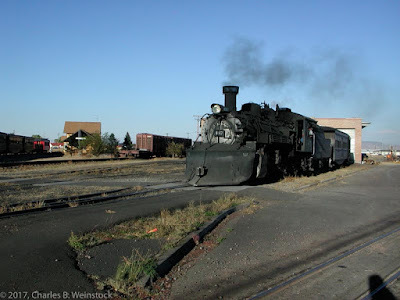 Today the train left Amarillo at 7am and ran to Pueblo, CO via Trinidad, CO. It was scheduled to arrive at 6pm. Most of this mileage was new to me. The morning was set aside for activities in the Pueblo area, with the train leaving at 1pm, arriving in Denver at 6pm. There was no new mileage for me on this day. I believe that there were three possibilities for the morning. 1) a tour of the Department of Transportation's test facility near Pueblo, 2) an excursion train to the Royal Gorge, or 3) hang around Pueblo. I think my friends and I opted (mostly) for option 3 since all of us had ridden through the Royal Gorge in the past. 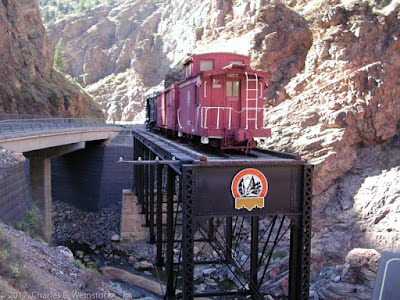 At Denver, John met the train and he and I went to the nearby La Quinta to check in. We then picked up some of the others and went off to dinner nearby. It was at the La Quinta that I first really became aware of how serious John's breathing problems were. He had been out of breath on trips in the past, but this was the first time I'd shared a room with him and he had an oxygen concentrator waiting for him in the room. The concentrator (which my Mom also had for the last years of her life) was a noisy contraption...but it was necessary. It was also predictable in its noise which made it possible to sleep in spite of the noise. This morning I was further educated as to John's problems as, when Reg Mitchell showed up with our Avis Impala rental, the first thing we did was to transfer a bunch of oxygen tanks to the trunk. During our ride, John and Carol rode in the back seat with oxygen tanks between them. He thought he might need them due to the high elevations through which we were driving, but he never needed to use them -- only his concentrator at night. Had John not been with us, we probably would have taken a more-or-less direct route to Durango, probably via Salida, Del Norte, and Pagosa Springs. Instead, under John's expert guidance due to his extensive knowledge of Colorado narrow gauge railways, including long gone ones like the Denver & South Park, we spent the day following a route that took us through Leadville, Salida, Gunnison, Montrose, Ouray and down the Million Dollar Highway to Silverton before heading into Durango. 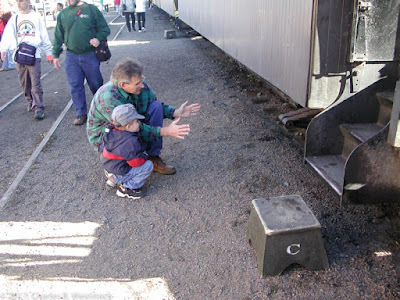 The railroad history was incredible and because we had an expert with us we saw things such as still-visible railroad grades (tracks long gone), water tank footings, etc., and learned much more than we otherwise would. The scenery was amazing, especially the aforementioned Million Dollar Highway, which hugs the side of a mountain much of the way. 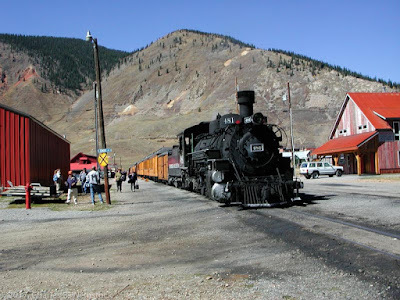 The train laid over in Silverton for enough time for us to look around the tourist trap and have lunch and then retraced its route back to Durango arriving about 5:30pm. At this point we got into our car and headed to Pagosa Springs for the night, arriving in time for dinner at about 7:30pm. 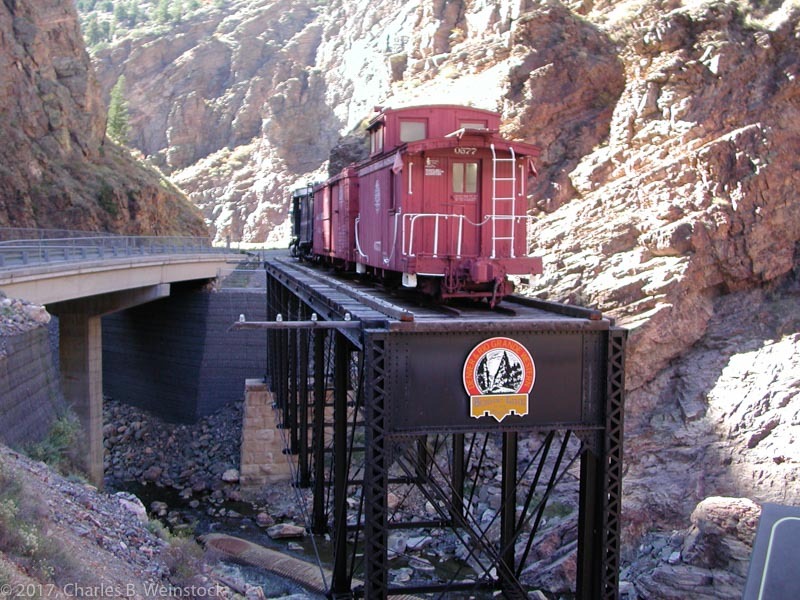 The other remaining remnant of the old Denver & Rio Grande Western narrow gauge empire is the Cumbres & Toltec line between Chama, NM and Antonito, CO. There are lots of ways to ride this line, but if one wants to ride the whole line in a day it requires a bus ride in one direction. However we had a magic token with us that allowed us to skip the bus ride. The token's name was John Arbuckle. 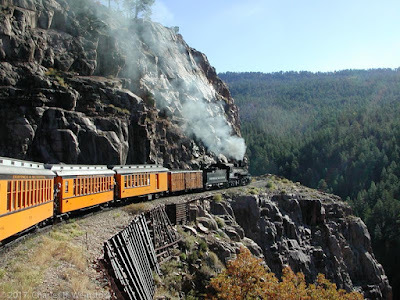 He had ridden the line enough in the past that he was happy to chase the train in the car as best he could and then meet us at Antonito upon arrival. We spent about an hour in Chama looking at the old railroad facilities (it felt as if we had gone back in time) before boarding the train. 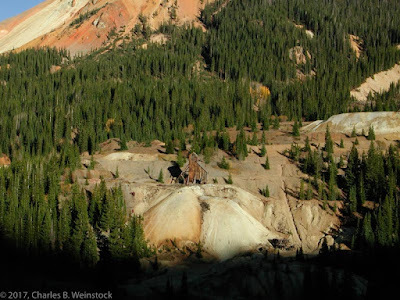 As John had told us, the climb out of Chama was like nothing any of us had ever seen or experienced. We had double headed 2-8-2s (K-37 #497 and K-36 #487) for the climb out of Chama (7,871 feet) to Cumbres Pass (10,015 feet) in about 13 miles more or less. 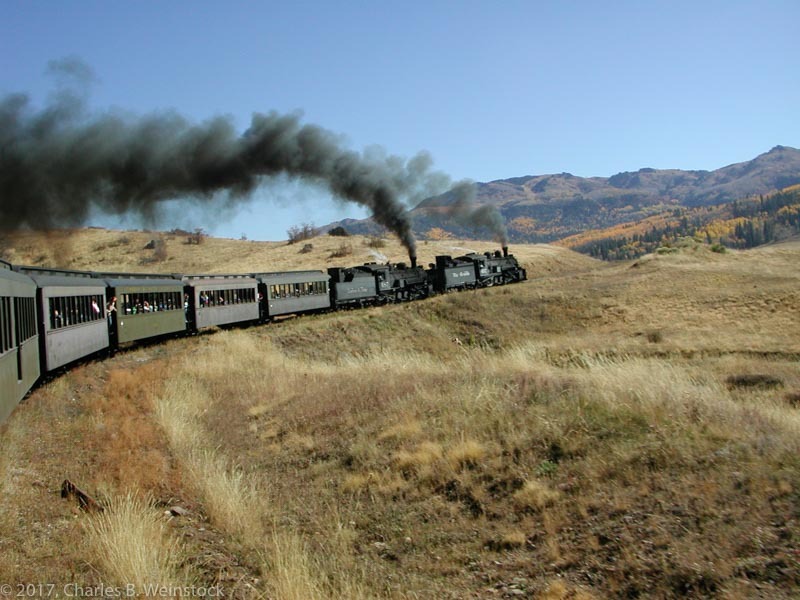 Spectacular, both in steam locomotive operation and scenery! We all agreed that if we had to do only one of the rides, this was a lot better than the Silverton. But that's like saying having a thousand dollars is better than having $900. We pulled into Antonito in the late afternoon (after switching trains at the lunch stop at Osier) and there was our friend John awaiting us. We spent some time photographing the switching around Antonito and then drove up to Alamosa where we checked into our respective hotels. Reg and I stayed at a Comfort Inn while Carol and John stayed at a Super 8 down the road. I remember dinner was at a very good Mexican Restaurant mainly because it was John's go-to restaurant in Alamosa (and thus we ate there several times over the years) and you could always count on him to pick a good Mexican restaurant in most any city we traveled to. Reg remembers he and I helping John to update his computer that night. Today was mostly a day spent getting back to Denver. We started out heading East out of Alamosa over La Veta Pass. It would be a number of years before I was able to get the rail mileage through the pass. We then headed up I25 from Walsenburg arriving in Denver late afternoon after a stop for lunch in the old railroad depot in Colorado Springs. We transferred our luggage to the train and Reg turned in the rental car. A bunch of us went out for dinner and after saying goodbye to John, returned to the train for the night. Dave Ingles had elected not to take the return trip and I was scheduled to occupy Bedroom "B" by myself. However, some time before the trip began, Nav Fosse had a problem with fitting people into the car. He had enough beds, but not in the correct combinations. He asked me if I would be willing to share Drawing Room "D" with two other friends, Sy Reich and Robbie Mandeville. I agreed, so I had a lower berth there instead. I believe I spent Monday night on the train and then caught the subway out to O'Hare airport in time to catch my 10:50am flight to Pittsburgh. Arrival in Pittsburgh was scheduled for 1:14pm and (assuming I was on time) I picked my daughter Lizzy up at her school before heading home. Interestingly enough, all parts of the narrow gauge tour are still doable in 2017. The AAPRCO routings are much harder to come by, but it is not beyond the realm of possibility. What isn't possible (alas) is a guided tour with my dear friend John Arbuckle.